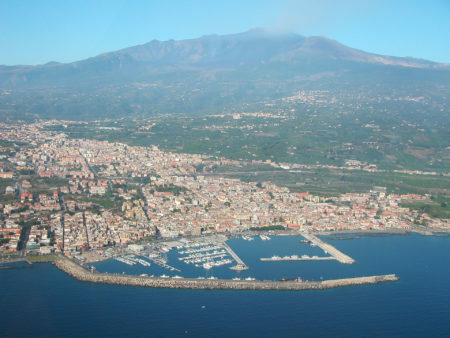 A pleasant small town in the province of Catania, it boasts not only a long marine heritage which makes it one of the major tourist marinas in the south, but also the cultivation of the ‘pomelia’ (scient. name: Plumeria), a plant from central america, widespread in the Hawaiian Islands. Riposto’s ancient tradition of cultivating this plant is, together with Palermo, unique to Sicily. Walking through the streets, the visitor will appreciate the explosion of colour illuminating the town’s balconies and will surely stop to admire the care and dedication the residents show to this special plant. 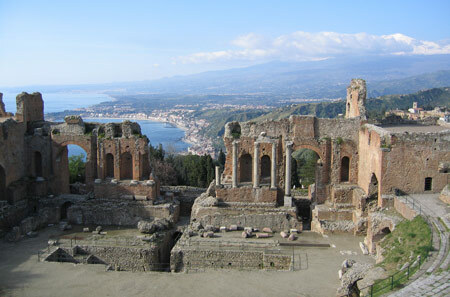 Taormina, known as ‘the pearl of the Mediterranean’, is one of the most famous internationally-known towns of Sicily. It is a unique melting-pot of treasures with its architecture, greek town plan, scenery, monuments and archaeology. 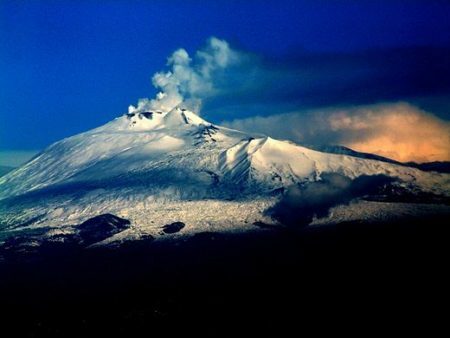 The majesty of Etna acts as a frame, along with the charming coast from Capo Taormina to Isola Bella, with the town’s pleasant climate making it even more attractive, especially in the winter months. The town was founded in 700 B.C., as referred to in the Bibliotheca Historica di Diodoro Siculo. It is the highest active volcano in Europe at 3,350 m, with a diameter of 45 km, and foothills touching the sea. The volcano’s form is modified at each eruption, creating depressions, deep gorges and new valleys; at a distance the overpowering spectacle of an eruption from its smoking cone can create wonder and amazement in the observer. “The craters, the ash, the lava flows, the lava caves and the depression that is the Valley of the Bove, make Mount Etna a primary destination and an important international research centre, besides constituting a major contributor to the history of vulcanology, geology, and other Earth Sciences”. Furthermore: “its fame, its scientific value, its cultural and teaching opportunities are important to the whole world”. These are the reasons UNESCO has give World Heritage status to the Sicilian volcano. 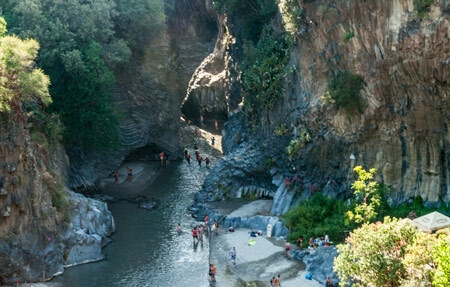 One of Sicily’s most famous tourist spots, these deep gorges have been excavated from the columns of basalt lava by the Alcantara River. To visit the gorges means to enter the bowels of the earth, experiencing a natural phenomenon. The 50 m.high rocky walls of the canyons were created by lava flows cooling in the river’s icy water, thereby creating unusual rock formations. It is possible to wade in for 25 m. along the valley, through small lakes and pure waterfalls. There is a small beach at the entrance to the gorge which can be used during summer, that is until the water becomes too deep or the current too strong. Swimming is possible, but a wetsuit is advised. A town in the province of Catania, it is situated 150 m. high on a cliff above the sea. It is said that the town’s origins come from the Greek legend of Galatea, a nymph, and Aci, a shepherd, murdered by Poliphemo in an act of jealousy. Today’s urban layout of the town is typical of that of late-medieval Sicily. 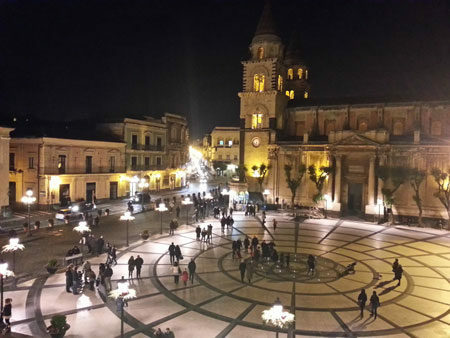 Numerous religious orders have made a profound mark on the town, and today Acireale is known as “the town of a hundred church bells”. Hit by the tremendous 1693 earthquake, all the churches and monuments in the town were greatly damaged, with hundreds of deaths. The early development of the silk industry brought wealth and fame to the town, and together with this economic success, a certain amount of cultural liveliness, leading to the foundation of the famous Carnival in 1594, and the foundation of the Zelanti Academy in 1671.